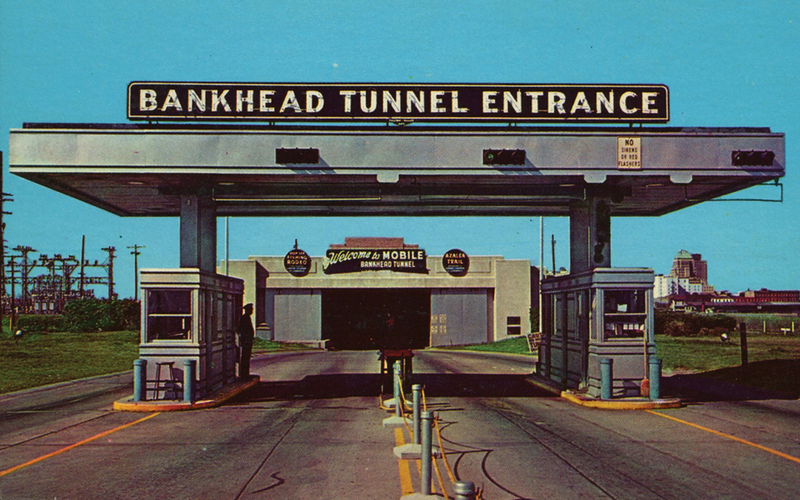 Did the Bankhead Tunnel ever have toll booths? The Bankhead Tunnel, as seen in the 1950s, with its now-removed toll booths. When the Bankhead Tunnel opened on Feb. 20, 1941, a toll booth was in operation at its eastern end. Signs at the western approach warned travelers of its existence. The charges varied depending on what went through the tunnel. A motorcycle was 15 cents; a “private car or taxi” was 25 cents; a station wagon would be charged 35 cents. Trucks were charged anywhere from 35 cents for a wrecker to $1 for trucks over 5 tons. Buses with more than 24 seats also were charged $1. Mobilians had long been accustomed to pay in order to cross the Bay. Ferry boats charged drivers a minimum of $3.10 for the car and an additional 40 cents for each occupant. When the Causeway and Cochrane Bridge opened to the public in 1927, the bay boats vanished and drivers now paid just $1 a car plus 10 cents per passenger. Reportedly, this often led to extra passengers riding in a car’s trunk to save on the added costs. The bridge and Causeway had been constructed by a private firm. The state of Alabama assumed its operation in 1937 and discontinued the toll. Travelers would thus have a brief break from paying a toll before the arrival of the new tunnel just four years later. Drivers could still cross via the Cochrane Bridge and avoid the toll, but most would prefer to cut the extra 7 miles out of their travel and use the Bankhead Tunnel. The Bankhead Tunnel arrived with a long list of prohibitions. No vehicles were to enter driven by “incompetent or intoxicated drivers” nor any “slow-moving vehicles, which cause undue delay and interference with traffic.” Steam rollers or tractors with metal wheels were prohibited along with push carts or wheelbarrows. The toll revenue from the tunnel quickly escalated. For the remainder of 1941 the total was $160,554. Within two years it was almost $508,000, and by 1950 it was up to nearly $600,000. 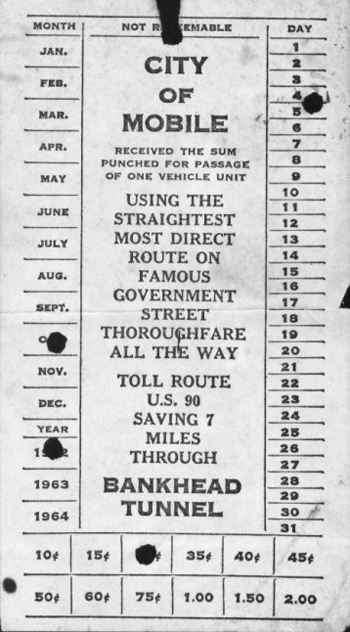 A Bankhead toll receipt from 1962. It would be more than two decades before an additional tunnel was constructed. The twin George C. Wallace Tunnels were completed in 1973 and were named to honor the current governor. As part of the deal, the toll on the Bankhead was abolished and none was ever charged for the twin tunnels. History seems to repeat itself. Summer weekend congestion and higher traffic counts led to a repeat of that 1951 observation that the tunnels were inadequate to handle the load. Currently, a new Bay bridge is in the works along with replacing the entire Jubilee Bayway, thanks to revised federal regulations. The latest proposal calls for a private entity to cover construction costs and some maintenance, as was done with the first Cochrane Bridge. Once completed, that firm will be collecting tolls for using either the Wallace Tunnel or the new bridge. The proposed toll would currently range from $3 to $6 per vehicle but would not be collected in a booth. Regular commuters may pre-purchase tolls, which will be loaded onto a windshield mounted transponder. Cameras will capture everyone else’s license tag and travelers will receive a bill in the mail, which will include a handling fee.